Showerheads can be a struggle to find... especially if you're after strength, durability and showerheads that give a great spray. At Neatitems.com... we're all about finding the best showerheads money can buy. We test every showerhead that we sell extensively. We carry a wide range of shower heads to suite every one from low flow showerheads to strong all brass construction. Our best seller by far is our Giessdorf all brass shower head. It's AWESOME!! - - gives a great invigorating spray and it's built to last and last and last!! We also carry a wide range of all brass rainshower heads in many sizes and styles. 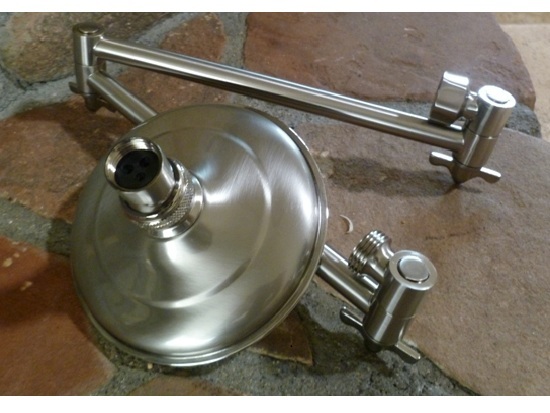 Looking to add a second shower head to your existing set up without a huge expense? Check out our dual shower heads. Or, if you are trying to bring out and extend your existing shower head from your shower wall, we also have a wide range of shower extension arms in all popular finishes. So browse around and if you have any questions, please don't hesitate to ask.